Don't spend another second worrying about compressing your images. Focus on your application and let ImgBot take care of keeping your images in good shape. Your users are increasingly mobile and you need to be too. Images account for most of the data downloaded on the go and can lead to seriously delayed page loads. When your site is fast then your users are happier, and when your users are happy, everyone is happy. This goes for apps and websites alike, if you want to load quickly, your images need to be optimized. Install ImgBot from the GitHub marketplace into your projects with the click of a button. 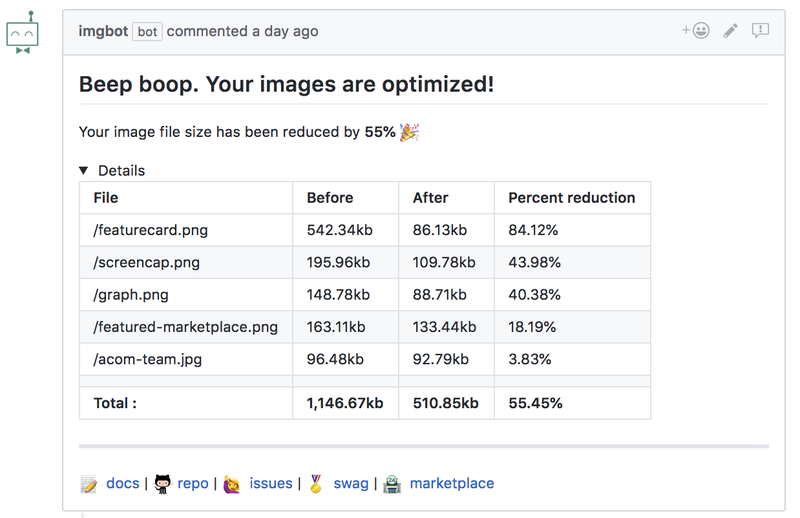 ImgBot will send you your first pull request optimizing all of the images that it can find. ImgBot watches for new images in your repository and opens more pull requests.